Dots Here, Dots There, Colored Dots Everywhere! 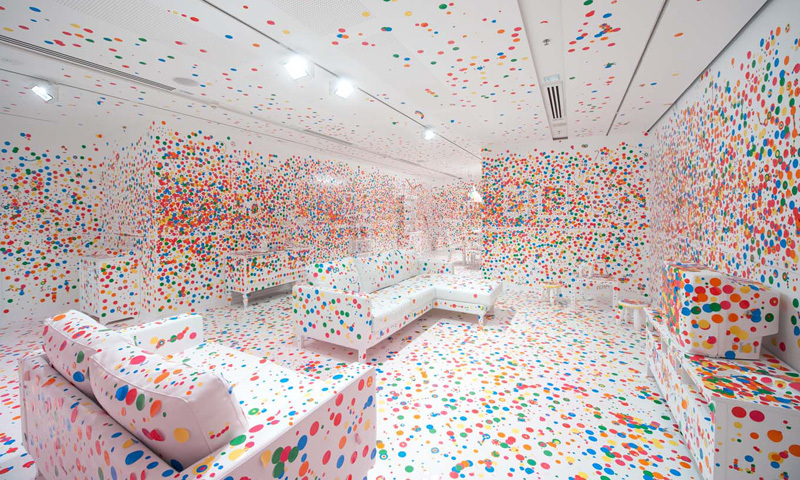 This beautifully imperfect color-splashed room is part of an interactive space at Queensland Gallery of Modern Art in their ‘Yayoi Kusama: Look Now, See Forever’ Gallery: it’s called The Obliteration Room. The photo is my Mark Sherwood. 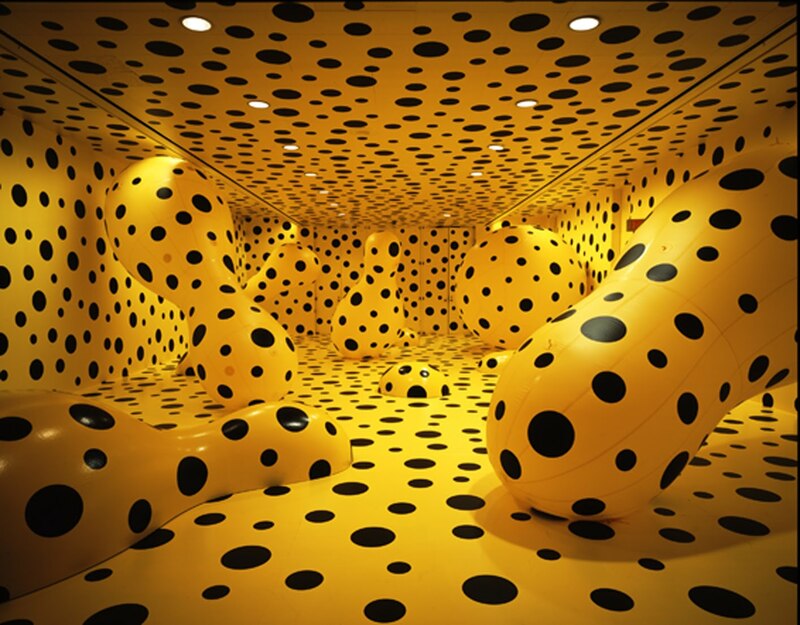 Japanese artist Yayoi Kusama did a similar installation in 2002, which was the inspiration for this vibrant experiment. The installation features a room filled with Austrailian-made (local to the Queensland Art Gallery) furniture, painted white, and subsequently decorated with stickers by visitors, particularly the little ones (I sure know my little one loves stickers). A few years ago, my husband took me to a Valentine’s Day Dinner at the Kennedy Center, which was then hosting an exhibit by Yayoi Kusama called “Dots Obsession.” It, too featured a room full of polka dots that rendered the fixtures indistinguishable from the walls and floors (and ceilings! ), but these were not stuck on, rather they were amidst inflatable protrusions and printed onto the walls, floors, and inflated shapes. You could literally walk through the huge shapes, feeling wonderfully disoriented. The best word I have to describe it is “fun,” and it was even more so because we visited very late at night after dinner. Almost no one was there. I think one of the things that has always attracted me to one of my favorite spaces (featured in Domino Magazine long ago), Jenna Lyons’ NYC apartment, is the painting above the mantle. It features dots not dissimilar to those from Yayoi Kusama’s Dots Obsession installation. The repetition combined with the variation of the sizes is consistent yet exciting. I just adore these dots. If you’re interested in a similar look, consider perusing Etsy for polka dot decals and try curating your own Dots Obsession. It’ll be some of the most fun you’ve ever had with stickers, I promise! ← Beautiful Breakfast Nooks, and a Winner!